Telemarketers have gotten more sophisticated in the past year. Instead of just blasting out recorded messages, they've started using software that simulates human interaction. The "caller" will ask a question, pause for your response, and then continue on. I actually got into an embarrassing argument with “Heather” before I realized that she was a relentless automaton whose sole mission was to sign me up for a free cruise. I hung up, and looked for a way to block that number from calling again. Carriers have begun to bow to pressure from customers and the FCC to provide call-blocking services. AT&T has a free call-blocking app that works with iPhone 6 or above, and with Android phones that are compatible with AT&T’s HD Voice. T-mobile provides a free service on certain phones that blocks calls or texts from numbers in a large database. Sprint and Verizon charge extra for call blocking. But call-blocking has been a feature of the Android operating system since v5.0 (Lollipop, released 2014). (Not sure what version of Android your phone is running? Click Settings, then About Phone, and you'll see the "Android Version" listed there.) To access Call-blocking on an Android phone running Lollipop, open the Phone app and go to Call Settings > Call Rejection > Auto Reject List. Enter the phone number you wish to block, and you’re done. For newer phones running Android Marshmallow (v6.0) or Nougat (v7.0), open the Phone app, go to your recent calls list, find the number you want to block and select Block/Report Spam. If you don’t want to report the number as spam, uncheck the “spam” box. Then tap Block. That’s a lot of work to block one number. Fortunately, there are some Android apps that make call blocking easier. Some can do tricks like blocking all “private” numbers or all numbers in a given area code, making them even more powerful. Should I Answer can block specific numbers or all numbers except those in your Contacts database. But it’s real strength is a community-sourced database of spam or scam numbers submitted by the app’s users, along with their notes on what type of unwanted call came from each number. You don’t have to submit every number you block to the community database. 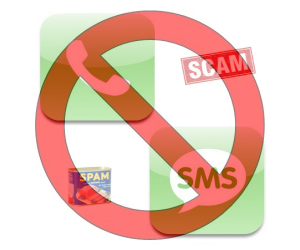 This app can also block calls from hidden or “private” numbers, premium numbers, and foreign countries. Also, it’s free! Extreme Call Blocker costs $4.99, but it has features that Should I Answer lacks. It can send unrecognized calls to voicemail, pick up and hang up automatically, or just mute the ringer. You can also use this app to block outgoing calls, and it has a stealth mode that hides the app. It’s now integrated with the FCC’s database of reported scam and robocall numbers for even greater protection. Hiya is a similar app that some AskBob readers have said works well for them. It can block calls and text messages, or blacklist unwanted numbers. Free, and available on both Android and iPhone. Most recent comments on "Android Tip: Block Calls and Texts"
I use call blocking but it's probably useless. Spammers change the caller id number on every call. It should be up to the carrier to check for valid numbers before my phone rings. You might wish to check out NoMoRobo at nomorobo.com. I haved used this terrific service on my Comcast VOIP line for many months and it has eliminated 90 percent (my estimate) of these kind of nuisance calls. They have a version for cell phones which I have not used for which there is a small charge. T-Mo only allows you to block 10 numbers at a time so my list is always "rolling". It works, though they could let you block more. At a minimum, the FCC should start enforcing their own rules regarding spoofing and robo calls. Sure the carriers would start screaming about loss of revenue, but it sure would get them some much needed customer satisfaction points. I use TrueCaller on my Android device, with no problems. It works and being free is a plus for me. It is also easy to use. I think anthony (above) meant an app called "Hiya"
Best one of the others and I've tried them all. I have been using Mr. Number for about 8 months and it seems to work really well and is free also. My other family members have been using it for around 5 or 6 months and like it. The method that I use is not to answer the phone if I don't recognize the number. I already have contacts so people I know, their name will come up. If someone really wants to talk to me, they will leave a message and I will get back to them if it's legit. Works for me. it tells me right away if I should answer or not. FREE AND SIMPLE. Have been using Mr. Number for a few years and find it useful but after your article I may give TrueCaller a try. Thanks for all your help. "For newer phones running Android Marshmallow (v6.0) or Nougat (v7.0), open the Phone app, go to your recent calls list, find the number you want to block and select Block/Report Spam. If you don’t want to report the number as spam, uncheck the “spam” box. " Not sure this is true for all phones. I do not see this option on my MOTOG3 running v6.0. But what I do is create a contact called Block Caller,and all calls from this contact go directly to voicemail. Any new spammer number gets added to Block Caller. For those that use Avast anti-virus on their Android phone, open Avast and then go to Settings (3 horizontal lines) - "Call Blocker" where you can turn it on and list any numbers you want blocked. I have only given my mobile phone number to a small number of friends and close relatives and a few businesses I deal with such as financial institutions. Consequently, I have had few problems with unwanted calls. When I received one call from an organisation I had not given the mobile number to I told the caller quite curtly that I had not given them my number and do not want to hear from them - and then I hung up. I only use my mobile for voice and text calls - it is not a "smart phone". I used a program called Call Blocker. As soon as my phone ring it jumps to the screen and give me the ability to block it. However I generally answer the call then when I hang up in give me the choice to block it again. If it is something to be Blocked, then I block it. What about land line phones? Yes, we have a land line, hubby is very old fashioned and doesn't want to convert. I tried to teach him how to use a very simple cell phone for seniors and he couldn't figure it out and only got frustrated. So alas we are stuck in the dark ages with constant robo-calls all day long. Please, help... any tips would be so welcomed. I was going to try TrueCaller, but so many of the reviews on the Play Store are quite negative, citing far too man unwanted features, with a high level of intrusiveness, and even p**nographic ads. I'm not interested in all that. Just yesterday I got a call on my Windows 10 phone and the spammer had hijacked my voice mail number and put it in place of the number they were calling from. That's a new one to me, and even True Caller identified it as someone from my contact list. I just blocked my own voice mail number and removed my contacts cell number from my list (kept the home number).